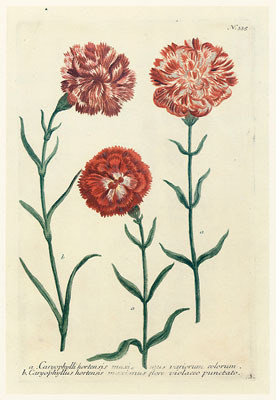 A beautiful set of Carnations - reproduction prints from Weinmann's (1638-1741) classic Phytanthoza Iconographia, a a four-volume work published by Lenz in Regensburg. Johann Wilhelm Weinmann (13 March 1683 Gardelegen, Germany - 1741), apothecary and botanist, is noted for his creation of the florilegium Phytanthoza iconographia between 1737 and 1745, an ambitious project which resulted in eight folio volumes with more than 1000 hand-coloured engravings of several thousand plants. He was born in Gardelegen son of the barber, Matthias Christian Weinmann. What is known of his early life is that he settled in Regensburg, or Ratisbon as it was known in 1710, and found work as the assistant of an apothecary. Weinmann prospered in Regensburg so that he was able in 1712 to purchase a house and apothecary shop. His wife, Isabella Catharina Fürst, was the daughter of an affluent wine merchant. In 1732, shortly after the death of Isabella, he was married again, on this occasion to Christine Catharina Pfaffenreuther, daughter of a town official. His business acumen was such that he was able to purchase an apothecary which had gone bankrupt, and turn it into a profitable shop. After his first marriage, Weinmann became embroiled in a drawn-out dispute with local apothecaries and physicians, brought about by his appointment in 1713 as Hospital Apothecary. The dipute was only resolved in 1715 with the intervention of the Town Council. Weinmann was reprimanded and his adversaries were instructed not to trouble him. Weinmann soon resumed his successful career, becoming a town councillor in 1722, a commercial assessor in 1725, and a city assessor in 1733. His business interests flourished, allowing him the freedom to indulge in his pursuit of botany. He created a botanical garden in Regensburg, published the Catalogus Alphabetico ordine exhibens Pharmaca in 1723 and contributed botanical notes as "Observationes und Anmerkungen" in the "Breslauer Sammlungen". The standard author abbreviation J.W.Weinm. is applied to species he described.